Goodpasture syndrome (anti-GBM disease) is a type II hypersensitivity reaction where autoantibodies are made against the glomerular basement membrane (GBM) and the alveolar basement membrane (Collagen IV specifically is targeted). 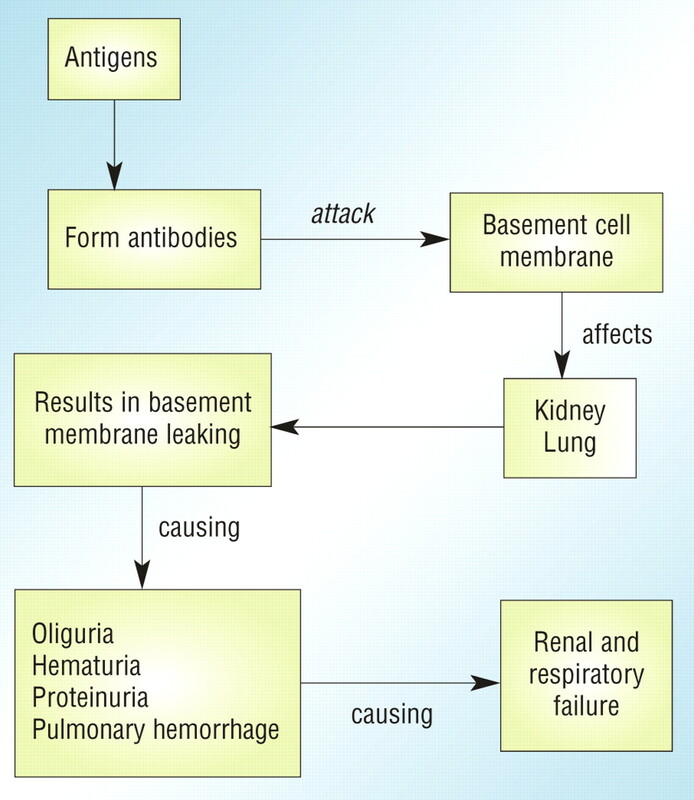 Cause: It is believed that injury to the pulmonary vasculature/glomerular basement membrane exposes antigens, which can cause a mounted immune response against them. The production of these autoantibodies leads to the immune mediated destruction of the GBM as well as the alveolar basement membranes in the lung. As a result, patients present with renal and respiratory complications (bleeding at both sites is common). Clinical presentation: hemoptysis and hematuria (foamy urine possible) are a common clinical presentation (these are the two that the Step exam may emphasize). Edema of the hands and feet is also possible. Respiratory involvement is common and in addition to hemoptysis, a common chief complaint is dyspnea (+/- dry cough). **Lung + renal involvement should suggest Goodpasture syndrome! Creatinine: can be elevated (although not always) dude to renal involvement. 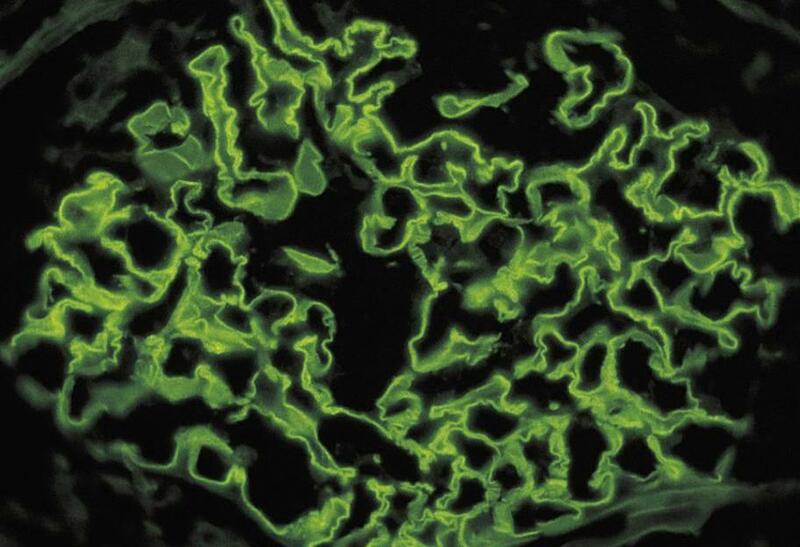 Immunoflorescence (IF): Linear appearance of IgG deposition on both glomerular and alveolar basement membranes (which shows the presence of anti-GBM antibodies). Plasmapheresis (plasma exchange) is conducted until the patient’s blood is rid of the anti-GBM antibodies. *Patients who smoke should quit in order to lower the risk of alveolar hemorrhage! Restrictive lung disease can be caused by Goodpasture syndrome. Chronic damage can lead to fibrosis of the lungs. Iron deficiency anemia can be caused by chronic bleeding. Goodpasture syndrome is classified as a type 1 rapidly progressive glomerulonephritis (RPGN). 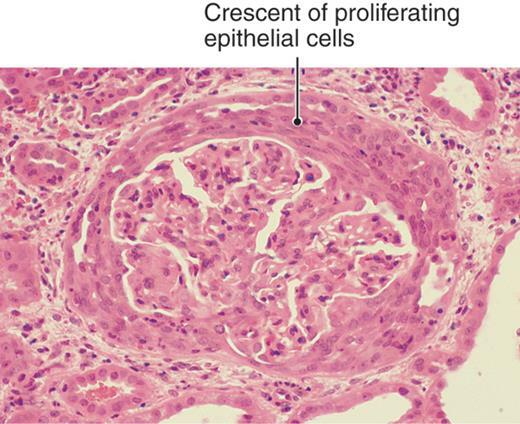 This presents as a crescentic glomerulonephritis on light microscopy (crescent shaped presence of epithelial/fibrotic cells in the glomerulus).